the rain fell down: Pop Love Will Save the World! Pop music is not about creating perfect records - it's about creating perfect moments. So said Tim Vass. 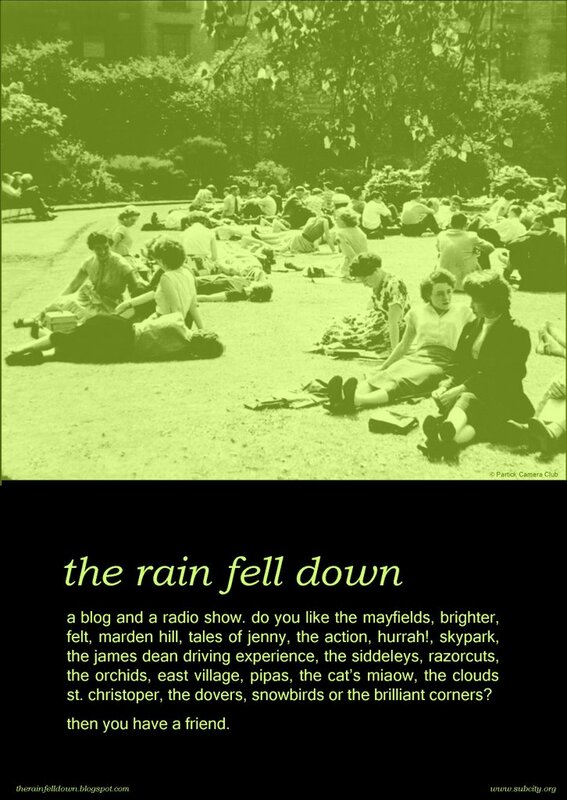 The Rain Fell Down is a radio show solely dedicated to pop music. And when we say pop music... we don't mean pop music! We mean POP! music, in the sense that Tim was trying to get at. Pop music was born in the sixties. Already then it was all about moments, the frivolous and the throwaway. Its medium was the 45 and it came in three-minute burst into which all your frustration, hate, ecstasy and hope was concentrated, canalised. That moment, when you had written that song and you knew that this was It, it was never going to get any better. That moment, when you heard a song and it made you feel alive for the first time. That moment that, though never experienced in the same way ever again, would always stay in your heart. It was about being young and foolish, when every day had its perfect moments. Some people stay young, even when they get old. Pop music is still young, even though it has 40 years weighing on its shoulders. It has always been there, whether it was The Subway Sect in 1976 or Primal Scream in 1986 or Belle & Sebastian in 1996 or maybe Your band in 2006. It may have gone from chiming Rickenbackers to sparkling laptops, from flexis to mp3s, from fanzines to blogs but it's still the same. So, The Rain Fell Down is about pop music, and all that comes with it. It's about staying independent. You've got advice for Us? We Don't Want To Hear It! We will make our own records, our own ideas, our own haircuts, our own perfect moments. It's not about being Different. It's not about being Superior. It's about being Ourselves. It's about politics in the same way Sarah Records was about politics. It's about putting a Chelsea boot to the fat behind of the establishment. It's about fashion and style in the same way Mike Alway's él records was about fashion and style. It's about getting stared at when you walk down the street. It's about making art and destroying art. It's not about pretensions, but ambitions - like The Creation saying their music is red with purple splashes. It's about joy and empathy. It's about wearing a badge to show your delight. It's about making the world more loveable. Anything bad can be made in to a song. Every week The Rain Fell Down will bring you perfect moments. From the past, from today, for the future. Perhaps a band, like The Clouds, only recorded one single and that was their perfect moment. That might be the song that changes your life, your perfect moment. Some of them might be gone forever, but We like discovering them, blowing off the dust and giving them to You. Have you heard "Deeper Than the Ocean" by The Mayfields? Yes? Then you understand what we're trying to say. No? Then you've missed something, but we will see to that. Some of these moments may be happening right now, getting lost in today's overload of information. We will pass you the word on what we come across, and we trust you to do the same. Have you heard Bubblegum Lemonade? We will play them for you. Maybe you would like to play something for us? The Rain Fell Down is about making something pretty while you can. If we're lucky, it might inspire You to do the same. Stay happy, be friends, and be our friends! Great manifesto, more or less inspired by Alistair Fitchett, isn't it? ooh, spooky, i was just going to post a comment and when the window appeared, there was my name. weird. And actually i just wanted to say that i suspected that Tim Vass might have 'borrowed' the idea for his quote from that Paul Morley extract on the back of the Magazine compilation album... i know that's where i knicked the whole "pop as moment" notion from. You? Here? It's a small world, definitely!!! "its not about being different. its not about being superior. its about being ourselves"
"its not about pretentions, but ambitions"
"its about making the world more loveable"
thank you for your kind words andreas. and as for the inspiration for it - many things, but some of matt haynes' writings to name one. of course i admire mr fitchett and pretty much share his views (and most of his favourite bands) but i don't think i had him in mind when writing this. (still haven't read "young and foolish"). as he says, the idea of the perfect pop moment "pops" up now and again in different places. Chris, i found a spare copy of Young and Foolish in the garage when opening the last boxes from the house move. You are more than welcome to borrow it - perhaps you could pass it on to someone else who might want to read it after you have finished? And then perhaps it could continue to pass on like a library book... i dunno. Just a thought!